Free lunch isn't so free. Fresh from our "Moving backward as a country" file, MSNBC's Alan Johnson is reporting on the problems that are arising from budget cuts that are affecting school free- lunch programs. To make matters worse, the cost is being passed on to paying students. The National School Lunch Program, or NSLP, requires participating schools to provide nourishing meals for all pupils. Johnson asks, "What happens when a child who is on free lunch doesn't have money in his or her pocket or money left on his free lunch card?" In Lee County, Fla., kids who can't pay get one free hot lunch. After that, they get a bare-bones "alternate meal," which consists of a cheese sandwich and a four-ounce juice box. While some would argue that that's better than nothing, others worry about the lack of attention being paid to meeting the nutritional needs of children in schools. We wonder, is this the best we can do for our children as a country? In terms of the cost being passed on to paying students, the School Nutrition Association reported that 60 percent of public school districts raised lunch prices in 2009, the last full year for which national figures were available. The Agriculture Department — which administers the NSLP — says that roughly two-thirds of the 5 billion meals served under the program each year are free or are sold at a reduced price. That means you can't keep raising meal prices indefinitely, because the burden is disproportionally placed on the pupils who buy the one-third of meals sold at full price. Johnson talks about the need to solve the problem of cutting free lunch and passing it on to paying students, because costs are going to rise with the new federal school nutritional regulations. Schools are going to be required to serve more fresh produce, lean meats and whole grains. If that's not complicated enough, schools would be able to argue for more money if more people actually signed up for free lunch. Although many families have lost jobs in the recession, many have not registered for free lunch because of social stigma and because they don't think they are eligible. Ironically, the "lean" meals — i.e., the cheese sandwich and juice box — are aimed at getting parents to enroll for free lunch so that schools can ask for more funding help from the government. Wow, that's really complicated. We're not sure why making sure that children get one hot meal per day is such a chore. What self-respecting country allows children to go hungry in its institutions? 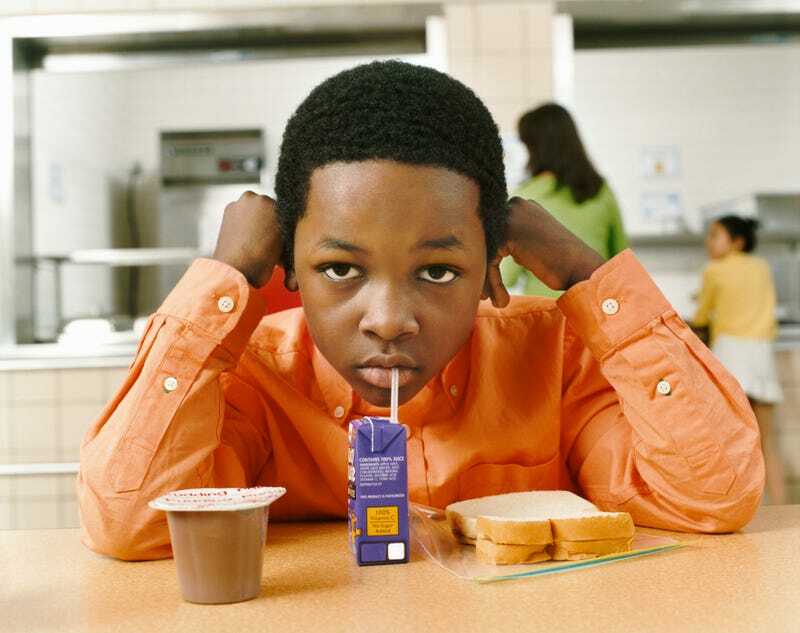 We complain about a student's inablilty to concentrate or stay focused, which may be because he or she is hungry or lethargic from a lack of food. If food stamps are getting cut, and free-lunch programs are being trimmed, just how, exactly, are poor children supposed to eat? How perverted is it to pass on the cost to other children and struggling families? It's not that complicated. Children should be fed at school, especially when they are there for hours at a time. Call us crazy again, but isn't that a necessity? In other news: VIDEO: Mom Forces Slacker Son to Stand on Corner With GPA Sign.